If you know me, you’ll know that I am a creature of habit. I do the same thing everyday after work. I go run. I drive home, and then I unpack my crap and put it in its proper place. Next I will re-pack my bag for the next day and then I will hit the shower. This is also true for the morning. I will get up and eat a bowl of cereal. Next I will check my e-mail and digg to see if there is anything interesting going on. After that I will hit the shower and get dressed and head out to work. I am so predictable that my dogs know when to head outside! See a pattern? Having said that, when I arrive at work, I try to park Thor in the same spot every day. The parking spot that I chose is the best one in the whole lot, in my opinion. It’s out of the sun for most of the day. One side is striped off so people can’t park next to me. And it is next to cover in case it is raining. The only negative thing is that it is just about as far as you can be from the entrance to my building as you can get and still be in the lot. I guess it is a positive also because people rarely park in it. Lately, Mr. Mark seems to think that it might be funny to park in “my spot”. The first day he parked in it I didn’t realize it was him until later. He overheard me talking to someone else about the jack@ss that was in “my spot” and admitted that it was him. He also explained that he did it just to drive me nuts. Which it did but I couldn’t let him know that. Following our conversation, Mark parked in “my spot” every chance he got. If I was late, he was there. If he was early, he was there. Frustrating… One morning I came in and some one had put TMC (Texas Medical Center) traffic cones in front of “my spot”. I just knew it had been him but he denied it……I am still not sure. We have been going back and forth over this for a few weeks. So on Friday, when I pulled into the parking lot I noticed Mr. Mark in front of me and figured it was payback time. It just so happened that this time he parked in the space next to “my spot”. So when I pulled Thor in to “my spot”, I got as close as I could to his vehicle without actually hitting him. There is no possible way he was ever getting back in his vehicle. You see Mark is a big guy. Not fat, more like a linebacker from Nebraska. Big. 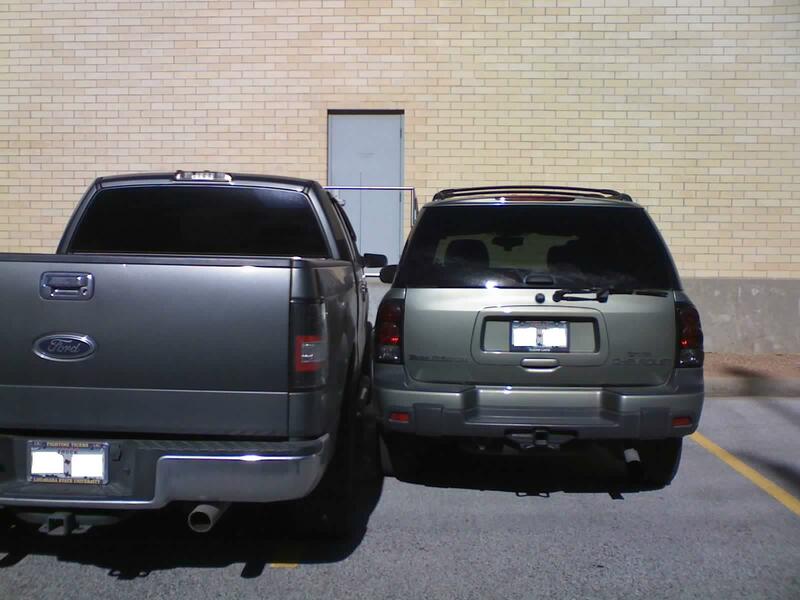 It would not be possible for him to enter his vehicle through the passenger side. Victory was sweet, but it didn’t last. … but it’s far from over.